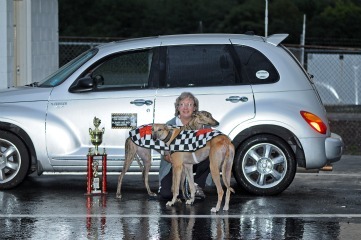 The life of the racing greyhound is not all champagne and glamour like a NASCAR driver. They spend up to 20 hours a day in a crate and sleep on straw or shredded newspaper. The day of the race they are not fed to avoid bloat. When the race is over they might be put on a truck and shipped to another track in a different state. Between races they are kept in kennels which may or may not be located on the track site. They consist of crates stacked two high. Females are smaller and jump higher than males so they get the upper bunks. The dogs begin their day early, they are muzzled and brought to the turn out pens which are urine soaked and crowded. The pens are sometimes too small for all the dogs to comfortably navigate and may nip at each other out of frustration which is why they are muzzled. To avoid the need for dogs to frequently relieve themselves they receive a limited amount of water. What does not go in doesn’t have to come out. If they do not perform well they will be “retired”. Before rescue groups became vocal about the treatment of these athletes, these greyhounds were either euthanized or sold to a medical lab for experimentation. There are documented cases of far more cruel fates for racers that didn’t do well. Until recently no one was really sure of the life expectancy of a greyhound because they were euthanized by the age of five. They may have another year or two if they went to a medical lab. Thankfully the rescue groups have taught us that greyhounds can live long happy lives and we should Race Cars Not Dogs. Greyhounds can achieve incredible speeds.They can go from zero to 30+ miles an hour in three leaps. Their top speed has been clocked at around 45 miles an hour. Injuries occur on the track and when they are running that fast sometimes the injuries are fatal. They run with no safety equipment, only a muzzle on their face and the will to win. The real winners are the ones who become rescued racers and spend the rest of their lives in a loving home. For a great many years I have been a fan of stock car racing. Since the 1950’s my Uncle Bud and his friends had a car club and raced at local tracks here in New Jersey. I was three years old when Wall Stadium opened and racing began there. Through the years I have enjoyed watching racing live at the tracks and on television—thank you Speed Channel!! Five years ago my nephew began racing and you know I have been in the bleachers cheering him on rejoicing in his victories and suffering along with him at the defeats. Cars can be fixed; they don’t feel pain and can race on for years and years. They are equipped with many safety features to keep the drivers safe. The drivers themselves are suited nose to toes with fire retardant clothing and a crash helmet. This year I had my greatest wish full filled---I DROVE A STOCK CAR IN A FEATURE RACE AT WALL STADIUM!!! Well I did not have to be asked twice. I got right to work borrowing some fire gear from a friend of mine who no longer races. Helmet, neck brace, fire suit, underwear, sox, gloves and a pep talk from a classmate who is a race driving instructor—thank you Diane Nichols of Diane’s Animal Grooming and Larry Reynolds. Also, many thanks to Steve Lynch for his fine car. I hope you enjoy watching my race as much as I had driving in the race. Let's all promote the theme Race Cars Not Dogs.